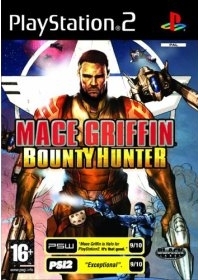 Mace Griffin Bounty Hunter isn't half bad. It’s a combination of first person shooter and space combat game, and the move from one to the other is impressively seamless.. you get into a ship, sit down behind the controls, and you’re in space combat mode. Quite the neat-o novelty, at least at first. Once you get past that, it’s typical stuff. You used to be a super space cop, you were betrayed after your first mission and get sent to prison, and on your release? A new career as a bounty hunter. Voice work by Henry Rollins is amusing – he does it well, don’t get me wrong – but it’s still a crack up hearing Henry Rollins doing game voiceover.. keep expecting him to yell "HA HA HA HA HA! SUCKER!"